A friend of mine had her baby at 24 weeks gestation. I got to go and see her in hospital the other day so I decided to make her a little hat to wear since I didn't want to go empty handed! This hat fits her really nicely and she is about 5lbs. It can easily be made bigger or smaller to fit by adding/taking away length rows or using a bigger/smaller crochet needle. I made her a few more aswell since she has to wear hats all the time now to keep her temperature up. 15. Bind off and weave in ends. 3. Bind off and weave in ends. thanks for this, its a lovely pattern and one I shall be trying out I think...if only for my daughter's doll! Altho I think a few might be made for my local NICU too. You don't often see pretty hat patterns in prem sizes. This is the most stylish way to keep the little one warm in the spring! These will be stunning on her!!! Aww, will Pin this to save for when I have a teeny baby in my life! 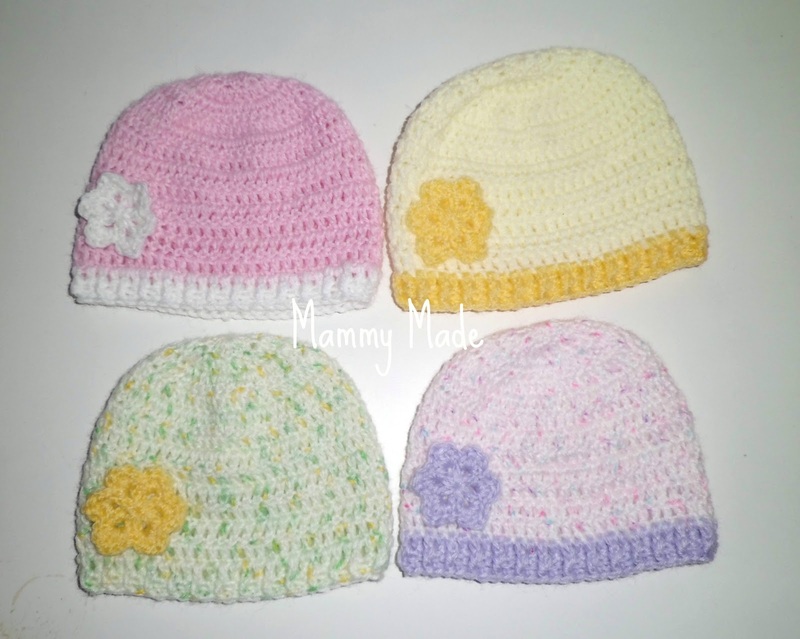 Wow Its wonderful preemie flower beanie. I like so much your post. It very colourful and I like this flower. what a lovely premie hat. 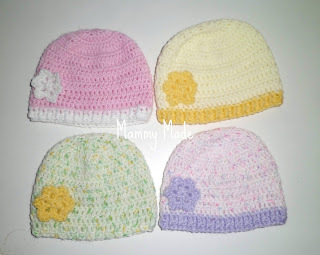 Thanks for sharing how easy it is to make the hat smaller or larger as well. I think a lot of people don't realize just how eays it is to customize the size of a hat. These are so cute! Thanks for sharing the pattern! Featuring this today on Serenity Saturday link party!!! My baby was born at 26 weeks. For the first few weeks he was on a ventilator and the only thing he wore besides a micro min diaper was the little knit hats that people donated to the NICU. This is a great pattern and I am excited to make some to give back to the hospital. Hi - I am a new follower. You have so many adorable things you have made. I am hosting a baby shower linky party at http://sewmuchclass.blogspot.com and would for you to check it out and see if you might like to participate. It is for a great cause - if not, I hope you will still follow!